Regular followers of the WDC Insights blog will know that self-employment is a topic we’ve examined a number of times before, drawing on Quarterly National Household Survey data. However this can only tell us what is happening in the Western Region as a whole, not in the individual counties. The publication of Census 2016 – Summary Results Part 2, included some initial data on labour force status including self-employment. Again, as mentioned in our previous post on Principal Economic Status, it must be remembered that the labour market definitions used in the QNHS and in the Census are different, so the figures are not directly comparable. In the Census, self-employed are referred to as ‘Employer or own account worker’. In 2016, according to the Census, there were 61,107 employers or own account workers (self-employed) living in the Western Region. This was 18.3% of all working people in the region. As we’ve mentioned before, self-employment is a particularly important source of employment in the Western Region. From Fig. 1 it is clear that there is a very strong spatial pattern to self-employment. The State average is that 15.6% of those in employment are employers/own account workers. The cities are where this is least common. Only 10% or less of workers in Cork and Dublin cities are self-employed. 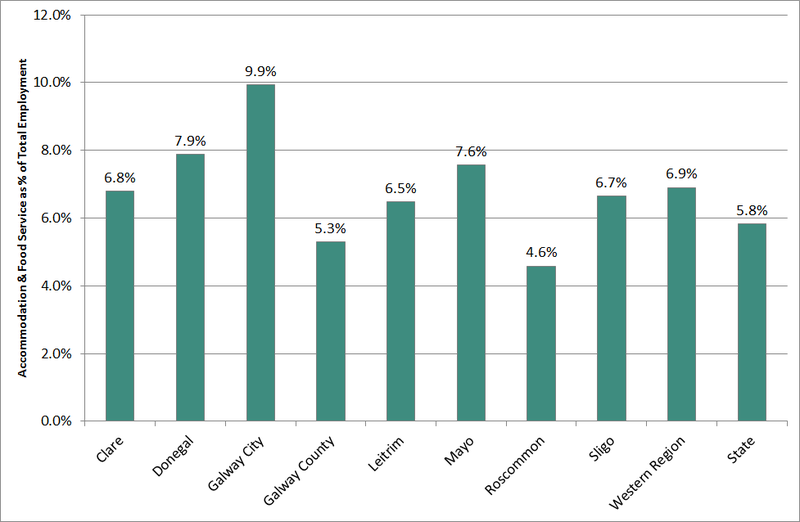 Galway city is next lowest at 11.1% and shows a very different pattern to the rest of the Western Region. Besides these three cities, it is the other Dublin local authority areas, counties in the Greater Dublin Area and the other two cities (Limerick and Waterford) which have the lowest incidence of self-employment. Indeed the 11 areas with the lowest share of self-employment are the five cities and the Mid-East. At the other end of the spectrum are the most rural counties. Co Kerry has the highest share of self-employment nationally at 21.1%, followed by Leitrim (20.3%), Cavan (19.9%) and Roscommon (19.9%). In total, five of the Western Region counties are in the top ten in terms of share of self-employment, with Mayo (19.6%), Galway county (19.5%) and Clare (19.5%) also having almost 1 in 5 of their workers self-employed. The strong spatial pattern of self-employment in Ireland is related to many factors but notably the sectoral and occupational pattern of employment. Agriculture is a major influence, with construction trades also having high shares of self-employed. These sectors play a more significant role in the economies of rural counties. The relative lack of alternative employment opportunities, especially in the more remote rural areas, means that more people choose (or are necessitated) to turn to the self-employment route. The WDC will be conducting further analysis of the sectoral and occupational data from the Census and its link with employment status, over the coming months. In every county in Ireland, a smaller share of the workforce was self-employed in 2016 compared with five years earlier. The national average declined from 16.9% of workers to 15.6%, with a decline from 19.9% to 18.3% in the Western Region (Fig. 2). Leitrim, Galway county, Roscommon, Mayo and Clare all had shares above 20% in 2011, with only Leitrim remaining over 20% by 2016. Among the western counties, Sligo had the smallest change in the share self-employed, declining from 18.2% down to 18%. From Fig. 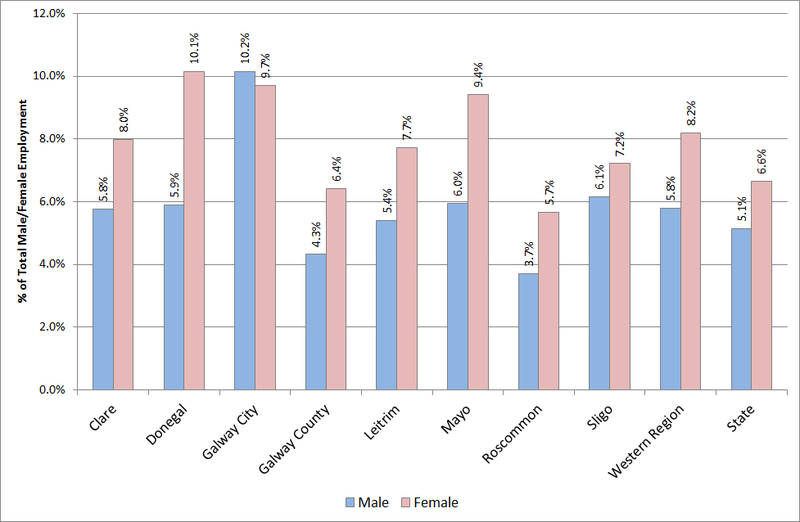 2 it is also clear how strongly Galway city differs from the rest of the region. One of the key reasons for the declining share of self-employment in the inter-censal period is the recovery in the jobs market. During the depth of the recession 2008-2011 employment declined hugely. Self-employment was not quite as impacted as some people who lost their job turned to self-employment, existing employers and own account workers may have been able to sustain their own jobs while having to let to employees, and there was the continuation of the trend of some jobs becoming contract/self-employment that would previously have been employees. Therefore as overall job numbers fell, the relative importance of self-employment as a share of total employment remained strong. As the jobs recovery began from 2012 and more employment opportunities emerged, the relative importance of self-employment declined. From Fig. 3 it is clear that between 2011 and 2016 the number of employees grew far more strongly than the number of self-employed. Nationally the number of employees in 2016 was 12.9% higher than in 2011, whereas the number of self-employed was only 2.3% higher. In the Western Region the number of self-employed actually declined in this period, down -1% while the number of employees grew by 9.8%. It is notable that for both forms of employment, the Western Region’s performance was weaker than the State average and the Rest of State. The decline in the numbers self-employed in the region is of some concern given its continuing greater significance in the labour market, especially in more rural counties (see Fig. 1 above). Across the region, Mayo, Galway county, Roscommon and Leitrim, the four counties where self-employment continues to play the largest role in their labour market (see Fig. 1) and the most rural, experienced declines in the actual number of people self-employed between 2011-2016. All other western counties had some growth in the numbers self-employed with the strongest growth in Galway City (2.8%), which nevertheless continues to have a low share of self-employed. In all cases the growth in self-employment was always substantially less than the growth in the number of employees. The main exception to this was Sligo, which had very low growth in employees at only 2.6%. Indeed Sligo had the lowest growth in employee numbers in the State in this period. While the relative importance of self-employment within the labour market declined between 2011-2016, largely due to the strengthening jobs market, it remains a very significant form of employment. In the five most rural western counties of Leitrim, Roscommon, Mayo, Galway county Clare, 1 in 5 of those at work, work for themselves. Nationally there is a very strong spatial pattern of higher rates of self-employment in rural counties, with the lowest shares in the cities and Mid-East. Some of the region’s most rural counties experienced a decline in the numbers self-employed between 2011 and 2016, the underlying reasons for this will only be apparent when the sectoral and occupational pattern of employment change in these counties is explored. https://www.wdc.ie/wp-content/uploads/wdc-567.png 0 0 WDC https://www.wdc.ie/wp-content/uploads/wdc-567.png WDC2017-07-26 10:15:102017-07-27 12:13:26Self-employment – What does the Census tell us? Jobs growth in the Western Region is much slower than in the rest of the country. Over the three years 2012-2015, the number of people at work in the region grew by just 2.8%, which was less than half the growth in the rest of the state at 6.3%. That’s according to a new Western Development Commission (WDC) publication ‘Jobs Recovery and the Western Region’. Interestingly, many of the new jobs are classified as self-employed which demonstrates that there is an entrepreneurial culture in the region. Over this period, the number of self-employed increased by 13.6% compared with just 0.7% growth in the number of employees. Self-employment is a more important source of jobs in the region than elsewhere, with 1 in 5 working people in the region self-employed, compared with 1 in 6 in the rest of Ireland. ‘While the jobs recovery that is taking place in the Western Region is welcome, the slower pace means the region is not fully benefitting from improving economic conditions. Limited job options, particularly in smaller towns, villages and more rural areas, means that more people are having to create their own jobs,’ according to Paddy McGuinness, Chairperson of the WDC. ‘65,000 people work for themselves in the Western Region with over three-quarters of them working alone. Fully recognising and supporting self-employment as a source of jobs growth is central to the region’s future. Addressing issues such as social protection, broadband access, isolation and support to scale are vital for the region’s self-employed,’ he added. The region’s slower jobs recovery is impacting on young people (15-24 yrs) in particular. In 2015 the region’s youth unemployment rate was 30.8% compared with just 20% for those living in the rest of the country. Young people who are out of work and not in education or training for a long time, face serious barriers in finding work. Employment in several of the sectors where young people often find jobs, such as retail and hospitality, declined in the Western Region between 2012 and 2015, while it grew in the rest of the country. ‘Our region’s young people are suffering because of the uneven regional spread of Ireland’s jobs recovery. This reality needs to be acknowledged and addressed in any Programme for Government agreed in discussions presently taking place on the formation of a new Government,’ concluded Mr. McGuinness. All data taken from a special run of the CSO’s Quarterly National Household Survey, Quarter 1 2012-2015 for the seven county Western Region.